Christmas is the time of miracles. However, miracles are all around us, all the time. Don’t like the “M” word? Okay…try movie moments. After the Astros gave Boone a chance in 1982, everyone thought Boone’s days in baseball were over. Except for Dan Boone. And his wife. They both understood that the dream remained. She encouraged him to pursue a chance in the newly-formed Senior League in 1989. Orioles scout Birdie Tebbetts, at age 77, marveled at how the lefty had mastered a new pitch: a knuckleball. 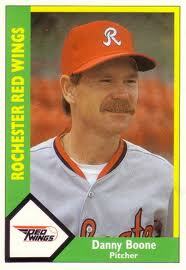 Against all odds, Boone became a 36-year-old prospect with the 1990 O’s. The dogged left-hander got his second chance in the bigs. “I started to mess around with the knuckleball when I was around 12 years old. My Uncle showed me the grip and I would practice throwing it just playing catch with friends. I never threw it in a minor league game in the early years but experimented with it in big league camp with the Angels and Padres. when I went to the Senior League in Florida is when I developed it into my #1 pitch. I used it to strike out Johnny Bench in Cincinnati in 1981. Kudos to the website 21 Greatest Days for telling the stories of Boone and other minor league miracles so well!